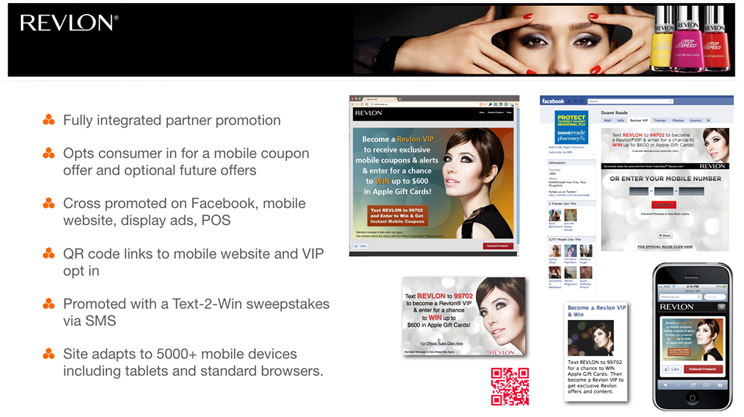 This fully integrated partner promotion with Revlon® and Duane ReadeTM drugstores included text-to-win elements as well as a Facebook promotional campaign with six rotating ads. The Facebook page invited consumers to enter their mobile phone number and receive text message offers for Revlon® products. Messages also included a link to a mobile website that was optimized for display on more than 5,000 different mobile devices as well as traditional web browsers.